Dow AgroSciences will release the beagles who were being used in a pesticide test to the Michigan Humane Society where they will be cared for and readied for adoption into loving homes. This is the exact outcome we have been working toward for many months now, since our undercover investigator found these beagles being used for the test, and we are grateful to Dow AgroSciences (Corteva Agriscience) for making the right decision for the dogs. I am also incredibly proud and grateful for you, our followers, without whom this victory would not have been possible. Hundreds of thousands of you contacted Corteva, first to demand an end to the testing, and then to ask that the company work with the Humane Society of the United States to find a suitable shelter for the dogs. I want to applaud our amazing staff at the Humane Society of the United States and Humane Society International who worked tirelessly to get these beagles out. Their expertise and devotion, as well as the strong partnerships we have built with the animal sheltering community nationwide, have made all of the difference for these dogs. The last two weeks have been intense, beginning with our Animal Research Issues and Investigations teams releasing the undercover investigation at the Charles River Laboratories in Michigan, where dogs were being tested for various products, including one of Corteva’s pesticides. While most of the dogs our investigator encountered were killed at the end of the studies they were part of, we discovered that 36 beagles in the Corteva study were undergoing unnecessary testing for a pesticide intended for Brazil, and we had a chance to get them out. Right away, our HSI staff reached out to Brazil and worked to get a waiver for the test. 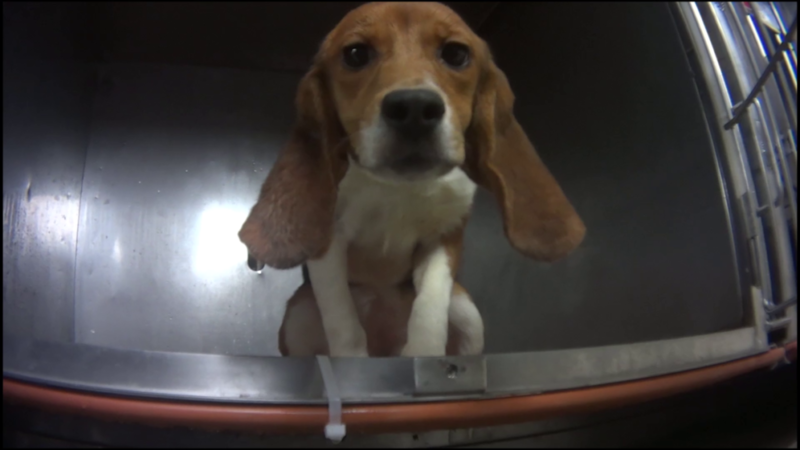 Once Corteva had ended testing, we convinced the company, with your support, to release the beagles to a reputable shelter where they would have the best chance of finding forever homes. The Michigan Humane Society, one of our 350 amazing shelter partners nationwide, stepped up to the plate and agreed to take the dogs under their wing. MHS has the expertise and a proven track record so we know the dogs will be in good hands. Our investigation succeeded in shining a light on the cruelty of animal testing and in raising awareness, but there are still thousands of dogs suffering in laboratories here in the United States and around the world. Our work to help them continues, but today, I am excited about this important victory, and for these dogs who have never known anything but life behind the bars of metal cages – they were born at a facility that breeds dogs for research after which they were taken to the lab. They deserve the best futures they can possibly get, and we are thrilled for the role we have played in saving their lives and making this outcome happen for them.